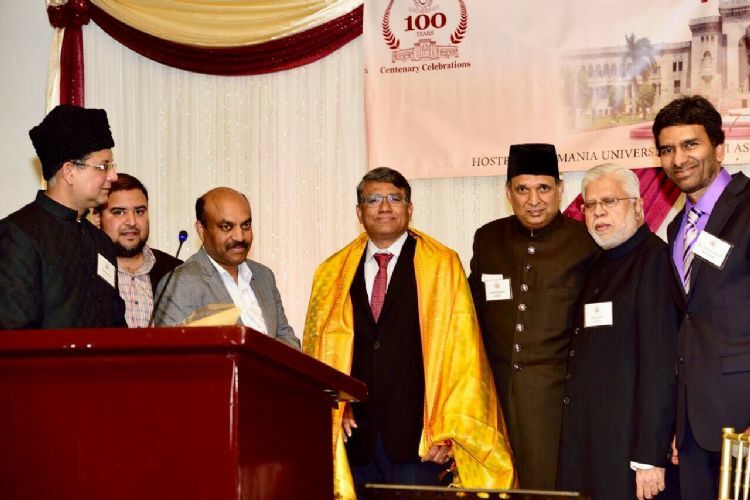 San Francisco, California: Osmania University Centenary Celebrations were very grandly celebrated in San Francisco Bay Area by Osmania University Alumni Association - North America Bay Area Chapter members with association with many other Bay Area Organizations. 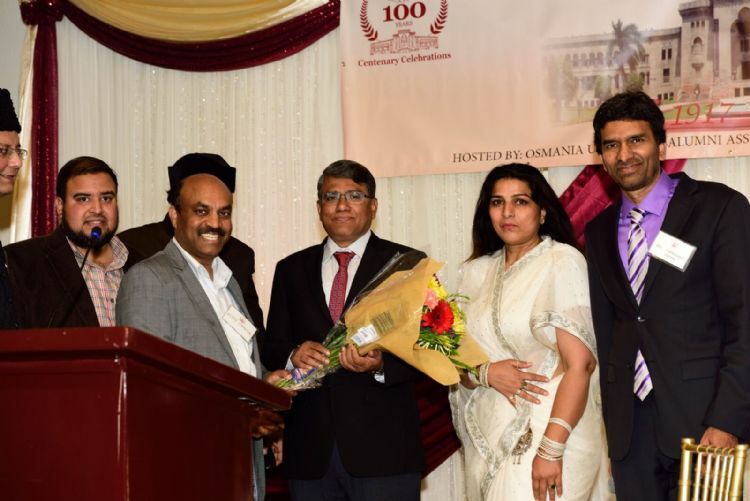 Hundreds of Osmania University Alumni gathered in Newark, CA on Sunday May 21st 2017 afternoon for the celebrations. Osmania University Vice Chancellor Prof S. Ramachandram was the chief guest and graced the celebrations. Other dignitaries who attended included Prof SV Satyanarayana (VC Telugu University, Ex Principal OU Arts college), Prof V Sathi Reddy ( Registrar Telugu University), Dr Yarlagadda Lakshmi Prasad (Central Hindi Committee Govt of India). 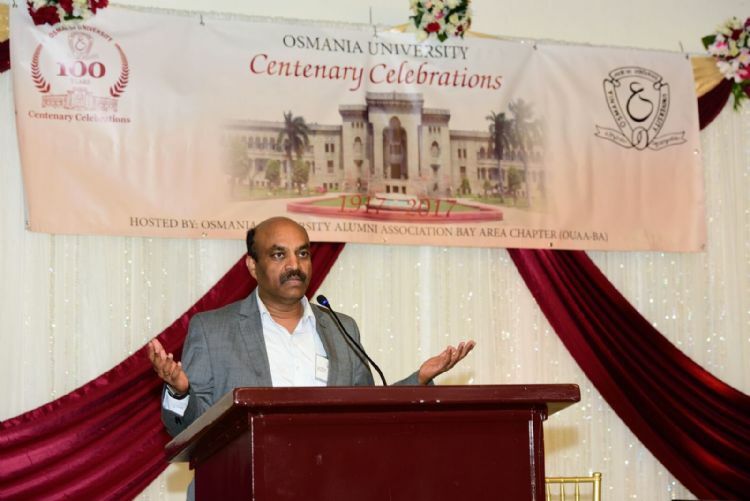 The keynote address was given by OU Alumnus and Adobe Systems CEO, Shantanu Narayan, who shared his fond memories of how Osmania University shaped his perspective on Life and given him great ability to think large and achieve more. The event started with playing of a video recording of Indian President Shri Pranab Mukherji addressing the tremendous gathering at OU Centenary Celebrations in Hyderabad recently, along with the video showing the great heritage of OU right from its inception by a fir-maan (Royal Order) by the 7th Nizam of Hyderabad, Mir Osman Ali Khan, who with a great vision & reverence to education launched this university, on 26th April, 1917. Prof SV Satyanarayana (VC Telugu University) shared that OU has inspired and provided great strength and power to all its students and they can achieve great things in Life like great infernos. He shared that he got the abundant blessings of both Telugu and Urdu languages at OU and attributed the credit for his success in life to OU and the greatness of its education system. Speaking at this occasion on behalf of Consulate General of India office, Consul Venkata Ramana admired OU for producing so many brilliant individuals. Further he mentioned that with large jurisdiction, OU has been overseeing and educating many thousands of students each year. Ahsan Syed (Board of Trustee , SIAM) shared the details of how he was from one of the first batches of OU when they switched from Urdu as medium of education to English in College of Engineering. He also gracefully mentioned that he has learnt 5 languages at OU that included Arabic, Farsi, Hindi, Telugu and English and shared snippets from all 5 languages and attributed the credit to the excellent education at OU. He also shared how the various great knowledge works in the world were translated into Urdu, which was the primary language of education, so that there was no barrier or need for the students to learn any foreign languages to excel. He also mentioned that the syllabus and curriculum for OU was modelled after MIT and thus very high standards were imbibed in furthering the knowledge to its students. He also shared a very beautiful song for OU that he wrote in Urdu, as a tribute song for the University he loves. Special Award of Professional excellence was given to Dr. Om Nalamasu, Senior Vice President and Chief Technology Officer, has been elected to the U.S. National Academy of Engineering (NAE), one of the highest professional honors for engineers. Ahsan Khan, President SIAM also welcomed everyone to the event and said that this is the first time that Osmanians have come together for an Alumni event here in Bay area, who not only belong to different organizations but included all individuals form diverse backgrounds. He said today's event is the true reflection of our Deccani Ganga Jumna tehzeeb. Mohammed Aqeel helped with registration desk along with Farah. Other attendees including Humayon Sohail ( Questivity), Shaista Ali (We Are One), Manohar ( Dir. IPG), Abdul Quddus were recognized for their wonderful contributions to community and for their support. A great flute live performance by Anis Chandani provided a very cordial atmosphere for the alumni when they interacted and socialized with their old friends and batch mates. A wonderful ghazal performance transformed the alumni back to the OU campus and the streets of Hyderabad and rich and unique Telangana heritage. Grand Sponsors for this event were Adobe Systems and Bramasol Inc. This event was supported by Telangana Cultural Association, SIAM (Society of Indian American Muslims), IMRC (Indian Muslim Relief & Charities), Bay Area Telugu Association, Silicon Andhra, Questivity Incorporated, Telangana American Telugu Association, Telangana Development Forum, Dr. Yaminali M. Javid M.D., CalSmile Dental and Solix Technologies. Some of the dedicated volunteers who helped for the event to run smoothly were Vijay Chavva, G. Mohammed Iqbal, Dhanunjay Boda, Bhaskar Maddi, Srinivas Gujju, Ahsan Khan, Mahipal Annam, Zafar Haq, Biksham Palabindala, Manzoor Ghori, Rafia Syed, Saber Hussain, Dr. M Nadeem, Srinivas Chukka, Ramesh Konda, Sagar Kotha, Farah, Buchanna Gajula and Vinoy Mereddy and many others. Thanks for the media partners Virijallu ( Radio partners) and many Indian News and TV Channels who supported and promoted the event.